With the Surface Pro 4 m3 Tablet, Microsoft delivers a powerful device that combines the best of both a tablet and a laptop. Equipped with Surface-Pen and Type Cover, the Microsoft Tablet has many different uses. The Surface Pro 4 from Microsoft has specifications more like a laptop than a tablet. Within it’s slim depth of only 8.45 mm, this device has a lot of computing power. The 12.3-inch PixelSense display provides a resolution of 2736 x 1824 pixels. The Microsoft Tablet is equipped with an Intel® Core ™ m3- 6Y30 processor in the basic version. This is passively cooled, which is why the tablet works silently. Nevertheless, along with the 4GB of RAM, It applies enough computing power to every office application and video stream. You are looking at about £1000 for a decent spec Surface Pro 4. They start at £750 but you are not getting much bang for your buck. 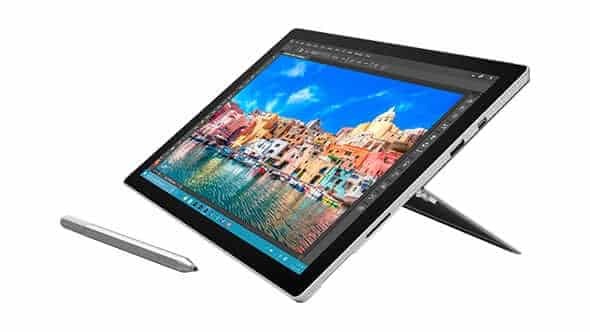 It is worth looking at what you will be missing as the Surface Pro is a tablet and not a laptop so it really depends what you are looking for. It is also a very expensive device if you compare the spec to a decent laptop with an i7 Processor however, it depends if you want a good spec with tablet features or just a high powered laptop which this is not. It is a cool device for those looking for the latest tech. Read more here.